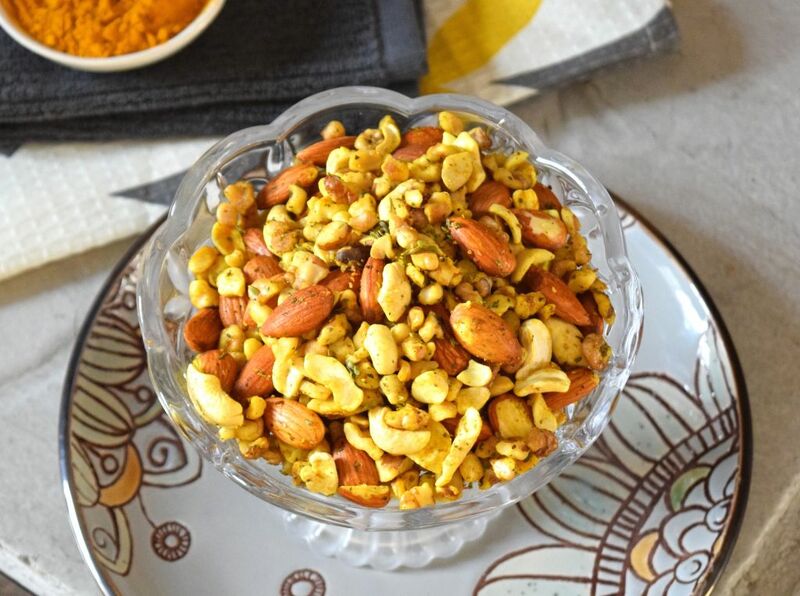 These Roasted Mixed Nuts are a delicious, rich, savory snack that will fill you up and leave you feeling good! 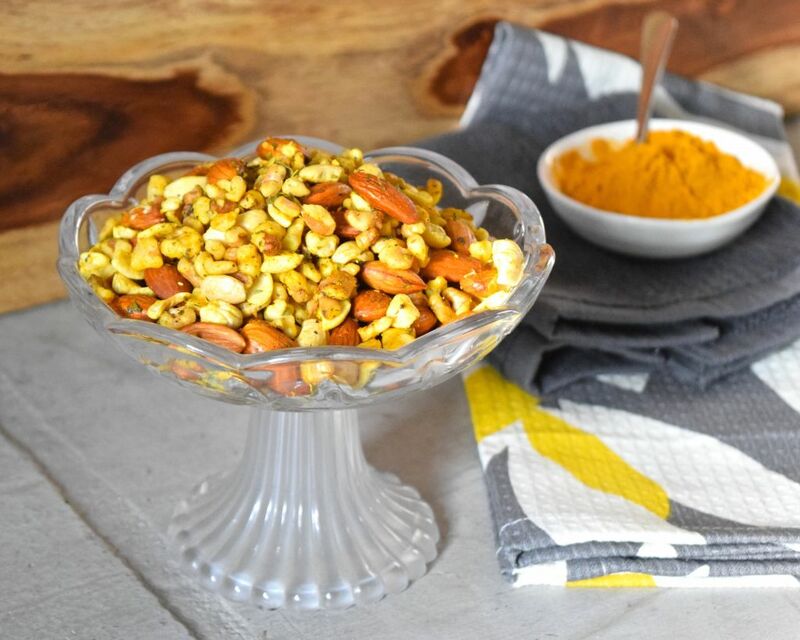 They’re easy to make, and turmeric gives them a beautiful yellow hue. Serve them at a party for a healthy, tasty appetizer…or just keep them around for munching on throughout the day! My inspiration for this recipe may surprise you! I was looking for something rich and savory to satisfy my craving for cheese, but I’m not eating cheese right now. If you’re not allergic to it, I believe that dairy is ok to eat in moderation, so my usual diet includes a little bit of it. This winter, however, I’ve been fighting colds and allergies that have made my lungs angry…they’re inflamed and I find myself struggling for breath quite a bit. Since dairy can cause congestion I’ve cut it completely out for the last few weeks, and I must say that I really miss the little bit of cheese I used to eat. If you’re wondering whether or not that really makes a difference, I can verify that for me it has made a huge difference. I get way more congested when I eat even a tiny bit of dairy. Usually something good happens when I have to change my diet. I get creative and find healthier ways to satisfy cravings, and then my body learns to crave healthier foods. This of course also benefits my children and husband, too. It’s a beautiful cycle! Nuts are rich and savory, and this recipe did a great job of satisfying that taste for cheese. Not only do these Roasted Mixed Nuts help me avoid making my symptoms worse and satisfy my craving, they actually make me feel better. The walnuts and turmeric are anti-inflammatory, so they help calm down the mess in my lungs. Walnuts have omega-3 fat in them, which helps inflammation, because it keeps the omega-6 fat in most other nuts and veggies from overpowering your system. Turmeric contains curcumin, a substance that is anti-inflammatory, and helps balance brain chemistry and put you in a good mood. You may have noticed that I’ve been using turmeric a lot lately, and I think it’s obvious why! One other food superstar in this recipe is the oregano. Oregano has strong anti-viral, anti-bacterial, and anti-fungal properties, which come in large part from a substance called ADP. Add it to as many dishes as you can in the winter, or when you’re fighting a cold! Before we get to the recipe for the Roasted Mixed Nuts, I want to invite you to join with others who are making healthy changes. I’d love to walk alongside you in your journey towards wholeness and health! Jesus said, “I have come that they may have life, and have it to the full!” Freedom from food addictions is part of having a truly full life. These roasted mixed nuts will be a superstar at any party, or just leave them on the counter for your family to munch on throughout the day! Click on the ingredients for a link to buy them on Amazon. Place the nuts on a cookie sheet and spray them with coconut oil. Sprinkle the nuts with the remaining ingredients and stir well. One Response to "Roasted Mixed Nuts"